London is the UK hub for culture, finance, tourist and government – and all that is powered by vertical transport getting people where they need to be and providing inclusive access across the capital. Keeping London lifts in tip-top condition is a major task, and it’s one that Tower Lifts engineers participate in every single day of the year. Our lift services in London need to be both preventative and responsive. Regular lift maintenance prevents lift breakdown and ensures the ongoing efficiency, reliability and safety of your vertical transport. When a lift breaks down or ceases to be reliable, we respond with prompt 24/7 lift repairs. A broken lift can severely impact the business and inconvenience passengers so we carry out instant repairs in London wherever possible. Owners, or managers of lifts used by employees or members of the public have a responsibility to keep them regularly maintained. The regulatory body PUWAR (Provision and Use of Work Equipment Regulations 1998) states that the work needs to be carried out by a trained lift engineer in compliance with Health & Safety regulations and the manufacturer’s instructions. 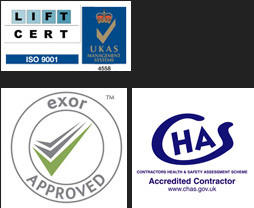 Tower Lifts’ engineers are are ISO 9001, SafeContractor and CHAS Accredited making them a natural choice to carry out regular lift maintenance in London. Lift Cabin Maintenance – call button lights are replaced if necessary and the electrical wiring in control panels is tested. The cabin interior is inspected, door panels are tested and clearance is checked. Acceleration and deceleration testing is carried out and firefighter lift controls are checked. Top of the Cabin – any debris accumulation is cleared and the area is investigated for vandalism or signs of rodent activity. The inspection station and cabling is examined, and all moving parts are lubricated. Pit Maintenance – the GFI outlet is inspected and lift cables are checked signs of wear. The sump pump is cleaned, and spring buffers are visually inspected for corrosion. The guide rails, rollers and levelling devices will be thoroughly inspected and moving parts are lubricated. First and foremost, lift maintenance is a cost-effective way to ensure the ongoing safety of your passengers, and reliability of your lift. Tower Lifts engineers will make running repairs during their maintenance checks, and flag up more significant repairs needing to be carried out over the next year. This way, lift owners are able to plan ahead, and allocate budget where necessary. In the long run, lift maintenance is a much cheaper option than emergency call-outs for one-off repairs! If you need lift maintenance in London, call us today on 01525 601099 and talk to one of our friendly engineers about creating a bespoke package for your needs.